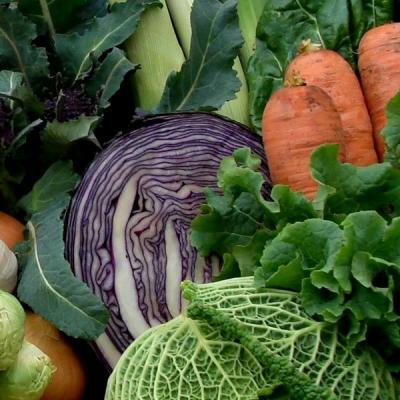 Organic vegetable boxes in 3 sizes, prices at £7.50, £9.50 & £12.50. These contain a variety of vegetables and salad, including weekly staples of potatoes, carrots and onions (2 vegetable exclusions are allowed). Please order a veggie box, and then add extras if required. Customers collecting from the farm receive a £1 discount, home deliveries by bike in Canterbury cost an extra £1.25. No minimum sign-up period, boxes can be cancelled as required for holidays etc. Small Organic Vegetable Box - usually contains 6 or 7 seasonal vegetables/salad including potatoes, carrots and onions. LARGE Organic Vegetable Box - usually contains 8 or 9 ssonal vegetables/salad including potatoes, carrots and onions.